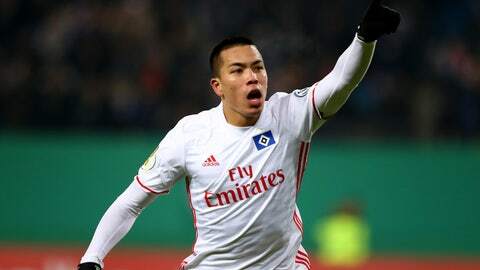 U.S. men's national team forward Bobby Wood scored his seventh goal in all competitions for Hamburg on Tuesday, helping seal the club's place in the quarterfinals of the DFB Pokal (German Cup) with an insurance strike in a 2-0 victory. After recovering a turnover by the center circle, Wood worked a one-two combination with Gideon Jung, who had scored Hamburg's opener in the fifth minute, and sliced through the center of the defense. Wood held off the challenge of a defender before hitting a right-footed strike from about 14 yards out while on the break to give Hamburg the 2-0 lead. The win puts Hamburg, which has struggled in Bundesliga play and currently sits in the relegation playoff place, into the final eight vying for Germany's domestic cup. Wood has three goals in the competition and an eye on a starting place in Bruce Arena's lineup on March 24, when the U.S. plays Honduras in San Jose, California, as World Cup qualifying resumes.